Cemented crowns on transmucosal abutments OR secured with screws directly into multi-unit abutments. 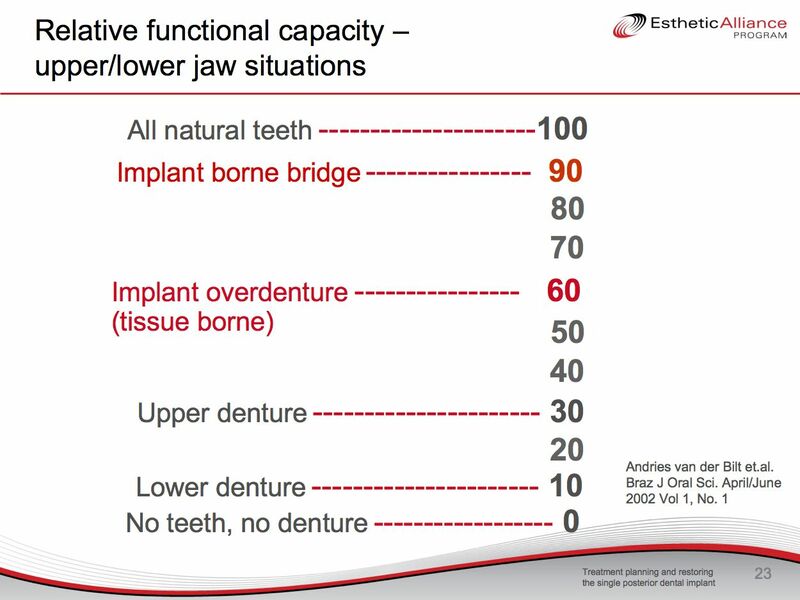 Basically just regular crown and bridge on implants. Also could be Ti or Zi substructure with porcelain veneer/overlay Jan 08. Requires 6-8 implants min., AP spread of 20mm, 2nd premolar area gets 10mm implant, must have only minor bone loss (especially in anterior esthetic areas). Must have contingency removable option presented. Contraindicated for class III patients (if trying to correct), those needing major lip support, and those with moderate to severe bone loss. 6-8 months in temporaries. Costs the most and loss of individual implant could be very detrimental. 2. Fixed detachable prosthesis=Fixed full-arch bridge on multi-unit abutments=Screw-retained hybrid denture=Implant (Abutment) Supported Fixed Prosthesis=hybrid denture=implant retained fixed denture=All on 4 or AO4. Some may say the term ISFP is only used for a segmented cemented prosthesis and all the others are fixed AND removable. Traditionally was denture teeth and acrylic attached to metal framework but some now doing ceramic teeth and pink porcelain or GC Gradia to milled framework of Zi or Ti. 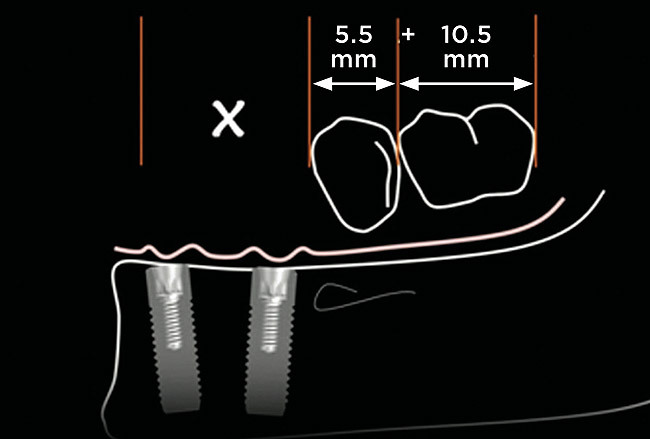 Requires 4-5 implants min., 1.5 AP spread x=10mm to get PM and molar cantilever, group function. 3a Implant Supported Overdenture is 4-6 implants in the anterior with bar superstructure. Completely supported by bar. The suprastructure is recommended to be precisely and rigidly adjusted to the milled bar and made of the same alloy. For mand. only with advanced bone resorption 15mm or more restorative space (maybe not quite that much in posterior). Good for high muscle attachments, sensitive mucosa, knife edge ridge, high mylohyoid, exposed mental nerve or IAN. 3b Implant and Tissue Supported Overdenture is either bar or studs on implants and prosthesis gets some support from tissue also. Requires fewer implants than any other option. min. in maxilla with no palatal coverage but full tuberosity coverage. 2 implants then denture looks just like traditional denture. Great for max. 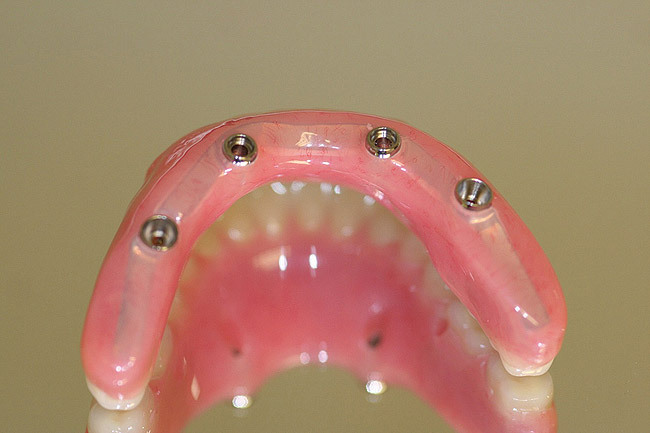 The milled bar implant supported overdenture presents lower prosthetic complication rates and needs less maintenance then the implant retained overdenture. 4. 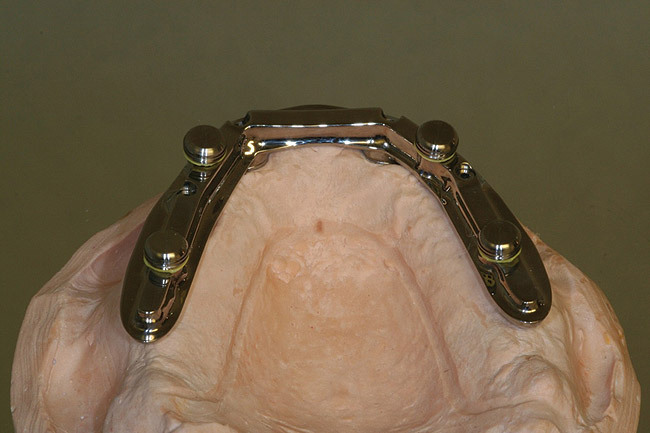 Fixed Removable Prosthesis=Marius Bridge=Patient Removable Fixed Bridge is similar to implant supported overdenture but is more secure. Consists of a meso-bar=primary bar and a superstructure. 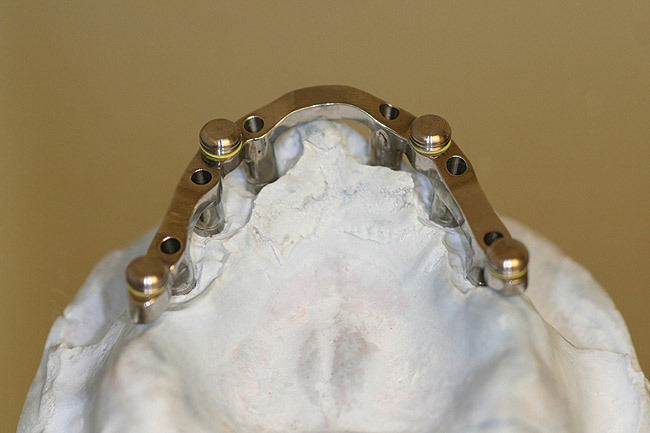 Superstructure attaches to fixed meso-bar with 3 frictional pins and 2 posterior swivel attachments and is also precision milled for frictional retention at 2 degrees. 5 implants min. Meso-bar must be at least 4mm tall. Very expensive, very technique sensitive, and requires patient dexterity. Only useful for patients with extensive bone resorption but that refuse to have any type of overdenture that have the dexterity to remove. According to Nader Sharifi only 5 US labs can make. If little bone resorption then Fixed ceramometal if meet requirements 6 implants, 20mm AP spread, 10mm implant in 2nd premolar. If moderate or more bone resorption than fixed detachable if can control lip support, can deal with speech issues, and not a high lip line. A high lip line or smile line can rule out the fixed detachable, all other choices are better options for this person. Implant and tissue supported if OK with removable and want 4 implants at least. Fixed removable good but expensive and tough to do. Main deciding factors for fixed versus removable is how lingual/palatal is the bone and the maxilla-mandibular relationship. Occlusal issues – can make Class III. Soft tissue support issues – lip and cheeks. If moderate or more bone resorption than fixed detachable is very good choice as are the overdenture options if OK with removable. Be careful what this occludes against though ie maxilla denture and maxilla will get destroyed. Very similar to denture planning. Make wax trial denture. Remove flange to see if need that support or not. Is the patient a bruxer and what will prosthesis be opposing? Need to level opposing arch. 11-15mm implant supported fixed prosthesis. Need more in anterior than in posterior. Need more if acrylic (=15mm ideal) then if zirconia (=10-12mm is adequate) or ceramics. The 10-12mm for zirconia starts to become an esthetic issue in the anterior as we are talking about 7-9mm for teeth which is pretty short. This is a double scan technique. One in which they are first scanned wearing the prosthesis and then the prosthesis is scanned by itself. If patient is edentulous then make a duplicate of the finished temporary prosthesis with to wear as a radiographic template. Patient wears during CBCT and besides reading bone levels can measure space available. Once have approved wax baseplates can just remove from mounted models and measure. There is several much more complex Aug 10ways to do this but I don’t see how they are a whole lot more informative. For options #3 and #4 both the implant or mutli-unit abutment should have healing cap if no SR temporary prosthesis.